11:31 a.m., April 13, 2011--Ever browse the aisles of a big-box store to check out the ingredients in that paint you’re going to use to decorate your child’s bedroom walls? Or in the lotion you’ll be applying directly to your face? McKay Jenkins has, and the results weren’t pretty. The Cornelius A. Tilghman Professor of English and director of the journalism program at the University of Delaware details his “field trip” to the discount store in his new book, What’s Gotten Into Us: Staying Healthy in a Toxic World. It’s just one chapter in a book that explores the prevalence of chemicals in common consumer products and the extent to which those substances make their way into our bodies. An experienced journalist and nonfiction author, Jenkins based the new book on his examination of numerous scientific studies and on interviews with experts, including some colleagues at UD, on a variety of subjects. 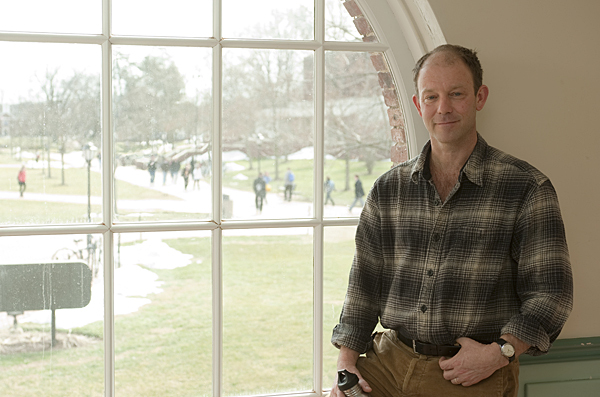 He will speak about his research and the book, published by Random House, as part of Earth Week activities on campus. Jenkins’ talk will begin at 1 p.m. on Wednesday, April 20, in Trabant University Center Multipurpose Room C and will be followed by a book signing. It was his own medical mystery a few years ago that gave Jenkins the idea for the book. When he was undergoing tests for what turned out to be a benign tumor, public health professionals visited his hospital room to question him about toxins to which he might have been exposed over the years. Even with a background as a journalist and then a professor“not exactly high-risk occupations”the list of potentially dangerous substances was frightening and made him want to learn more, he says. He focused the book on personal narratives of some of the many people he interviewed. He spent time, for example, meeting with organic farmers, visiting a woman suffering from multiple chemical sensitivity, touring a water treatment plant and turning a toxicologist loose in his own home to point out hazardous materials. He and Gerald Kauffman, project director of the Water Resources Agency, a unit of the Institute for Public Administration at UD, collected water samples while canoeing on the Brandywine, and Doug Tallamy, professor of entomology and wildlife ecology at the University and an authority on native plants, contributed his expertise on the environmental harm done by a typical suburban lawn. The book includes an appendix with suggestions for ways to reduce exposure to the toxic ingredients found in so many items. “We should be aware that these chemicals are in our consumer products and in our bodies, and there are all kinds of individual decisions and choices we can make,” says Jenkins, who adds that better regulation, including clear labeling, of consumer items and their ingredients is a necessary step as well.